The Aztec people were formed of several ethnic groups that occupied central Mexico. Predominantly this included groups that spoke the Nahuatl language and it was they who dominated large parts of Mesoamerica from the fourteenth to sixteenth centuries AD. The name itself, 'aztec', means 'people from Aztlan', a mythological location for the region's Nahuatl-speaking culture, but it was this that was later adopted to define the Mexica people. From the thirteenth century, the Valley of Mexico was at the heart of Aztec civilisation, and it was here that the powerful city of Tenochtitlan was constructed upon raised islets in Lake Texcoco. The city states of Tetzcoco and Tanayucan were founded by the Acolhua peoples in the uninhabited eastern area of the Aztec heartland. They were a cultural branch of the Aztec/Nahua migrants who arrived in the region in the fourteenth century, and both also bore some relation to Tepaneca culture. However, both the Acolhua and Tepanecs arrived before the main Aztec immigration, and Tetzcoco had a ruling family which was descended from Otomi speakers, switching to Nahuatl when their ruler, Techotlalatzin, decreed it. The placement of Acosta Acolhua in the list of rulers of Azcapotzalco is problematical, as he clashes with the (apparently) ruling ancestors of Acolnahuacatl and his son, Tezozomoctli. Even Acosta's existence is doubtful, considering the fact that it is related by the dubious Appleton's Cyclopedia of American Biography Vol 1 (which contains several faked biographies). The Acolhua peoples found the city states of Tetzcoco and Tanayucan around this time in history - the late twelfth century - so perhaps Acosta (if he is real) is linked to these events. Xólotl is claimed as the first ruler of Tetzcoco and Tanayucan, which makes Acosta's placement here unlikely. Xólotl is apparently the first ruler of Tetzcoco and Tanayucan. He conquers much of the Valley of Mexico, perhaps venturing as far as Cuauhnahuac. He also adopts the title, Chichimec Teuhctli ('Emperor of the Chichimec') to show that Acolhuan control over this older peoples of the region is complete. Son. Governor of Tetzcoco on behalf of his father. Brother. 'He Who Flattens the Earth'. Quinatzin is the first Chichimec emperor to rule from Tetzcoco. Techotlalatzin actively adopts the prevailing Valley of Mexico culture, which is predominantly Aztec. The city is apparently subject to Azcapotzalco at this time. Son of Chimalpopoca of Tenochtitlan. 'Black-eyed Flower'. Relations between Ixtlilxochitl and Tezozomoc of Azcapotzalco have been deteriorating for some time, and now open hostilities break out, with Azcapotzalco being supported by Tenochtitlan. Tetzcoco is defeated by Azcapotzalco in 1418 and is granted to Tenochtitlan as a tributary. The displaced prince of Tetzcoco, Netzahualcoyotl, is allowed to live in Tenochtitlan under the ruler's protection, becoming a firm ally when he later accedes to the throne of Tetzcoco. The displaced prince of Tetzcoco, Netzahualcoyotl, is allowed to live in Tenochtitlan under the ruler's protection, while his home city is controlled by Azcapotzalco. Netzahualcoyotl becomes a firm ally when he later accedes to the throne of Tetzcoco. The kings of Tenochtitlan are crowned in accompaniment with the subjugated Tetzcoco and the ruler of Tlacopan, members of the Triple Alliance which forms the Aztec empire. As the alliance gains in power into the 1440s, eighty per cent of the captured territory is divided between Tetzcoco and Tenochtitlan, with the remaining twenty percent going to Tlacopan. Tetzcoco also becomes the Aztec empire's cultural centre. Netzahualcoyotl avenges his father's death by retaking Tetzcoco with the help of the Triple Alliance under Itzcoatl, the ruler of Tenochtitlan. He is also the one who sacrifices the captured Maxtla of Tepanec. Son. 'Hungry Coyote'. A distinguished poet, philosopher & lawgiver. Miquiuix of Cuauhnahuac rebels against Tenochtitlan, but is quickly subdued by Netzahualcoyotl on behalf of the Aztec emperor. Forces from Tenochtitlan and Tetzcoco embark on a campaign that will expand the boundaries of Aztec territory dramatically. Their first major gain is the reconquest of Cuauhnahuac. The army goes further, into Mixtec territory, to defeat the city of Coixtlahuaca, killing the Mixtec ruler in the process. Son. 'Second ear of Maize'. Coanacoch flees before the approach of the Spanish conquistador from Cuba, Hernan Cortes. It is Cortes who records the captive by natives of a Spanish convoy in the same year. Only a few tens of kilometres from the relative safety of the Spanish army, the convoy of conquistadors and allies encounters a local people known as the Acolhuas, allies of Tetzcoco. Somehow, the caravan of male European civilians, soldiers, women and children, plus a large number of indigenous allies is captured. Over the next six months its members meet what would seem to be a grisly end. Traces of construction show that the Acolhuas rebuild Zultepec, a town just to the east of Tenochtitlan, to accommodate the prisoners. 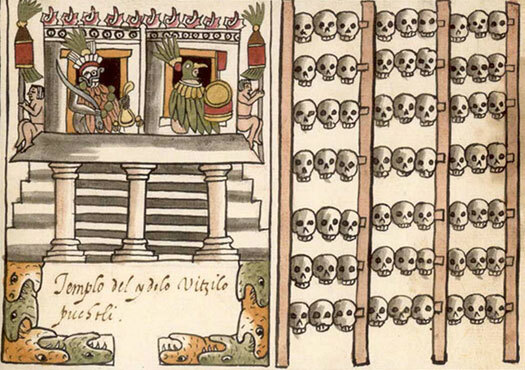 The town is eventually renamed Tecoaque, which in the native Nahuatl language means 'the place where they ate them'. Archaeological research from 2015 would appear to support this story, despite some academic resistance. Brother. 'Someone's Anger'. Spanish ally. Ixtlilxochitl had already rebelled against the imposition of Cacama on the throne. Under his rule Tetzcoco now defects to the Spanish, substantially weakening Tenochtitlan's resistance. Ixtlilxochitl is Christianised as Don Fernando Ixtlilxóchitl and remains in place as governor until, presumably, Spanish central control of Mexico is formalised with the creation of New Spain in the Americas.